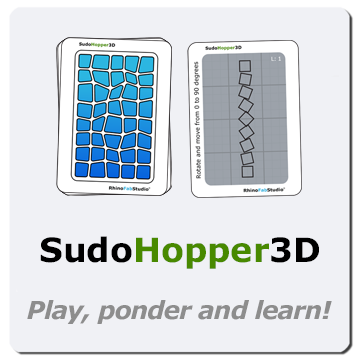 To help in learning Grasshopper, we have created SudoHopper3D, a card game to improve the overall understanding of parametric thinking. SudoHopper3D playfully takes you on a journey through mathematics, algorithms and basic coding. Players surprisingly learn concepts such as vector geometry and trigonometry. Download the free PDF file game cards by "purchasing" this product! It includes the game rules, the game cards ready to print and the Teacher's Guide that solves all the assignments step by step.